Ah, the good ol’ summertime. For me, summertime brings back childhood memories of long summer days spent at the Miller farm. I still remember that feeling of freedom when school was out and the whole summer was ahead of me. Karen, Grandma Miller, Jackie on THE Porch Swing. I spent nearly every summer on the farm with my Miller grandparents. I stayed with them during the day while my parents were at work. 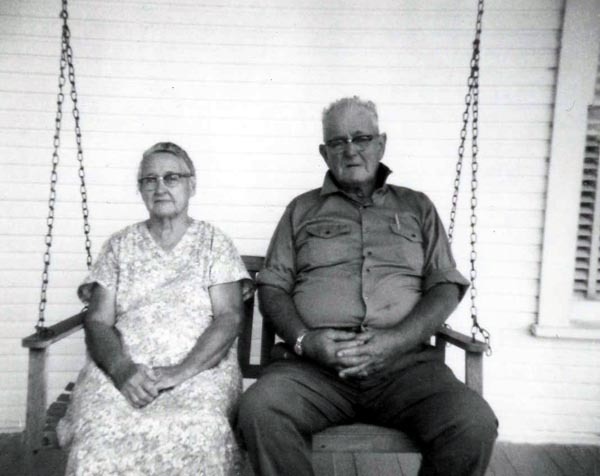 Many of those summer days were spent relaxing on the porch swing. Their porch spanned the entire front of the Miller house and the wooden swing was the main attraction. The house faced north so the porch was always in the shade. 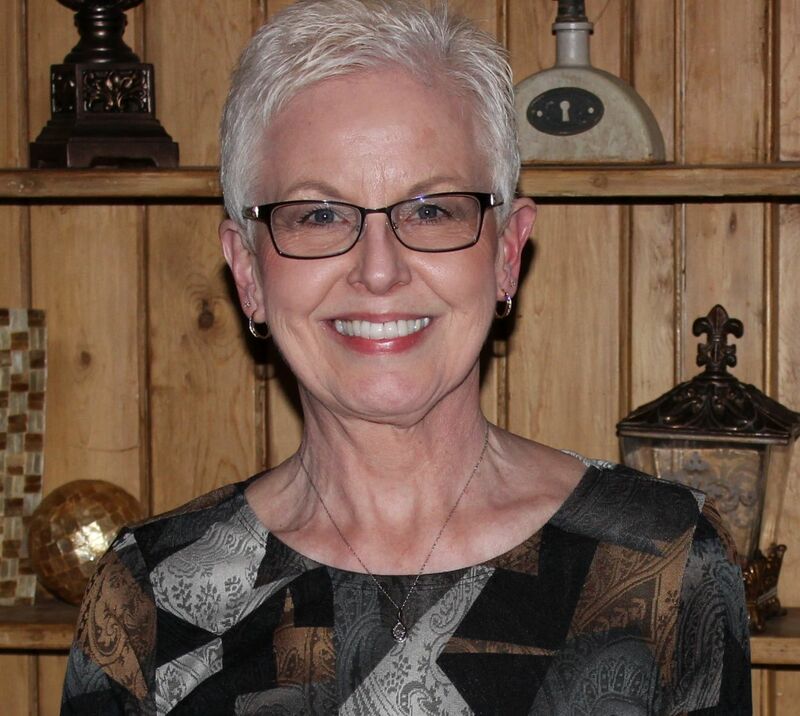 The swing was like a magnet that drew family members and friends to it. It was an inviting and relaxing place to gather and sit. You could see a lot from that swing. Grandma’s garden and the few neighbors’ homes were to the left. The Miller barn and barnyard were to the right. In front was the long lane that led to the seldom-traveled township road. We spent many hours on that swing doing some very important things: Waiting for the mail to come. Keeping cool in the days before air conditioning. Watching it rain and staying dry at the same time. Reading the Daily Standard. Talking and gossiping. Waiting for the milk man and the bread man to come with their goodies. Drinking a cool drink on a hot day. Watching the farmers work the fields. Whistling back and forth with the Bob-Whites. Shelling peas and snapping green beans. Napping. Pretending the swing was an aircraft. Watching the humming birds visit Aunt Ann’s gladiolas. Watching the few cars go by on the road. Getting a picture taken on the porch swing. 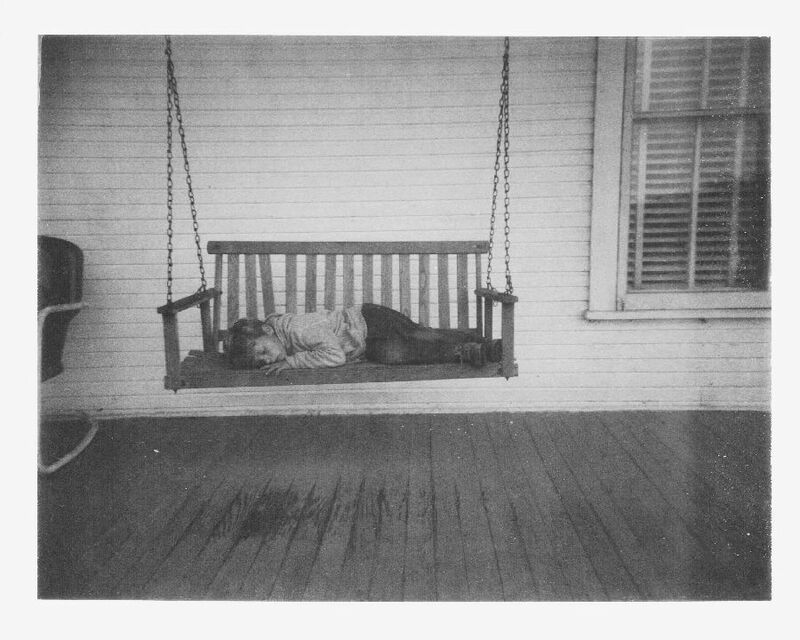 The porch swing was good for napping. 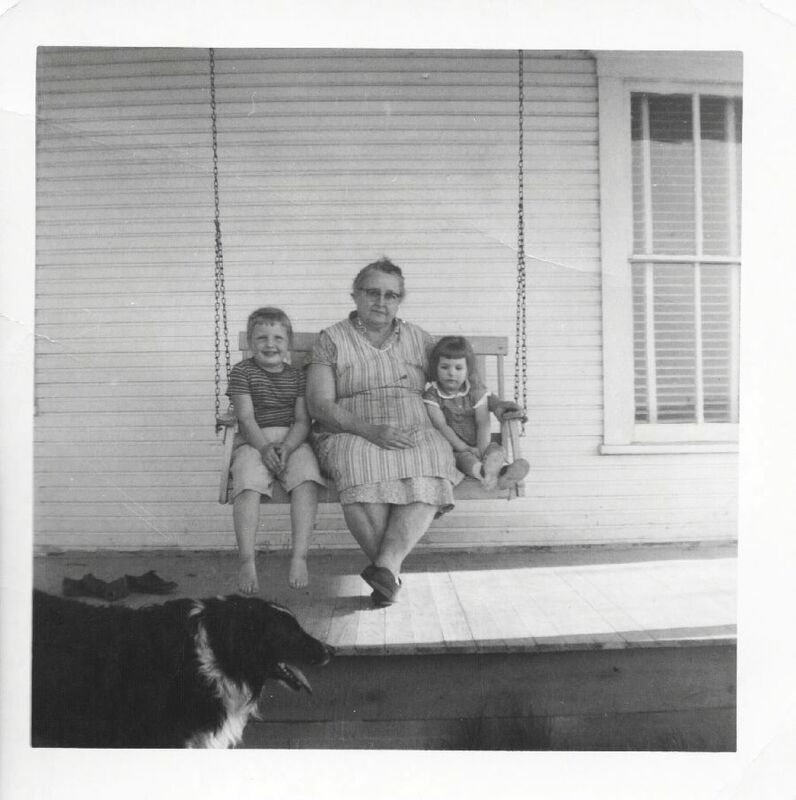 Our Miller family has an unusual number of photos that were taken on the porch swing. In fact, more photos were taken on that swing than anywhere else on the farm or in the house. 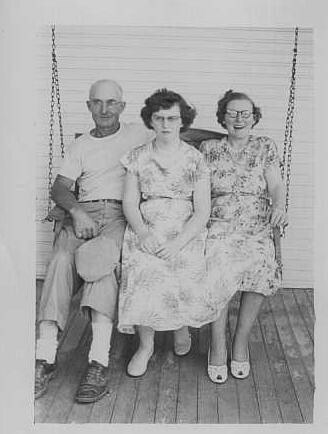 Relatives crowded onto the porch swing for a photo. 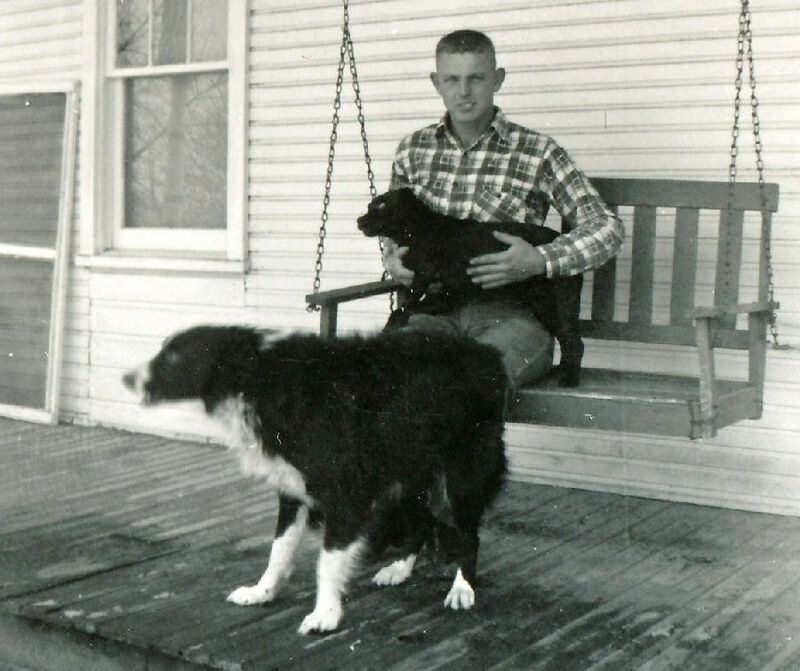 Uncle Kenny with his dogs. One reason for the swing’s photographic appeal could be that a flash was not necessary. But I think the main reason was that it was such a comfortable and relaxing place to sit and gather and visit. Everyone was happy on the porch swing. 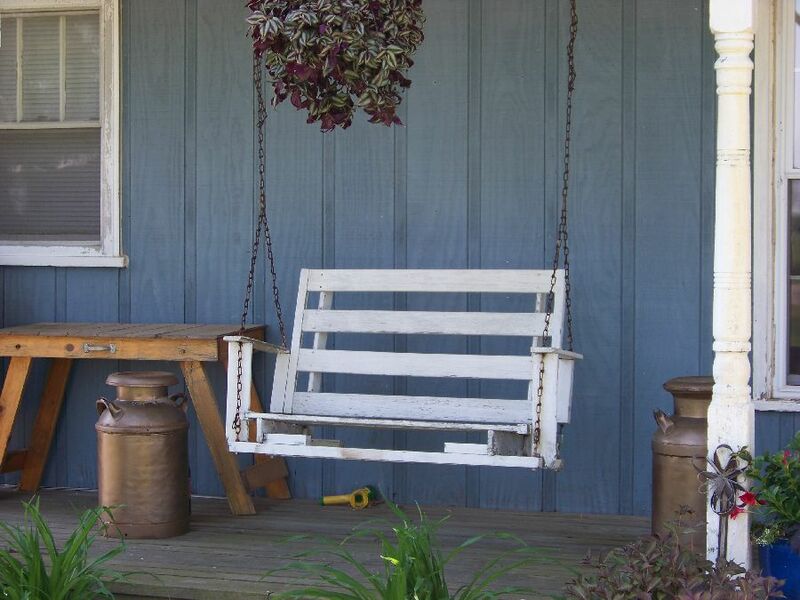 The Miller farm house now belongs to another family, but a porch swing is still a part of the front porch. I hope they will enjoy their swing as much as we enjoyed the old one. Those were the days. A nice gentle breeze and a cold glass of iced tea.It didn’t get much better than that. You paint a nice picture! At Fort Wayne,IN in the 1940’s & 50’s we had a glider with vinyl covered cushions on our porch facing east. Spent many a days reading comics out there & at night stayed out there until the 2 story house cooled enough upstairs to sleep. That sounds like the glider we had at home. There is nothing better than reading outside in the shade in the summer.